The procedures for adding a window in a load-bearing wall and adding one in a wall that isn't load-bearing are basically the same, but there is one important difference. In both cases you must add a horizontal beam to the wall framing to protect the top of the window, but if the wall is load-bearing, this beam, called a lintel, must be larger to support extra weight. An undersized lintel can result in damage to the window, a sagging roof and other problems. The width of the window and the weight of the wall supports determine the size of the lintel. Measure the width of the window you're going to install with a tape measure and make two marks on the wall the same distance apart at the planned location of the widow. Measure an additional 1 1/2 inches from each mark and make new marks, then draw vertical lines through the outer pair of marks from the floor to the ceiling with a pencil and a spirit level. Cut along the lines with a drywall saw and remove the drywall between the lines to expose the wall framing. Tap 2-by-4 studs that fit exactly between the top and bottom plate of the wall into the gap on either side of the opening and adjust them so they are plumb and their outer faces are flush with the edge of the opening. Screw the to the top and bottom plates with 3-inch screws. Mark the planned position of the top of the window on one of the studs, measure the distance from the mark to the bottom plate of the wall and cut two studs to this measurement. Screw these king studs, which will support the lintel, to the studs framing the window opening and to the bottom plate of the wall. Cut a lintel from appropriate lumber to span the opening. Take the measurement of the lintel length from the studs framing the opening, not from the king studs. If the window is less than 4 feet wide and the wall doesn't support much weight, 4-by-6-inch lumber is probably strong enough. If the window is wider, though, or the wall supports a lot of weight, cut the lintel from 4-by-8 or even 4-by-10-inch lumber. Make marks on the existing wall studs in the opening at a distance equal to the height of the king studs plus the width of the lintel from the floor. Cut through each stud on the mark with a reciprocating saw and remove the lower section. When you have cut all the studs, set the lintel in place on the king studs. Screw it to the king studs, then screw the upper part of each cut-off stud to the top of the lintel. Add a 2-by-4 to the framing to support the bottom of the window. Cut it to fit between the king studs and position it at a distance from the bottom of the lintel equal to the length of the window. Make sure it is level and screw it to the king studs. Cut studs to fit between the one supporting the bottom of the window and the bottom plate of the wall and position them to line up with the studs between the top of the lintel and the top plate. Plumb each one with a level and screw it to the bottom plate and bottom of the window opening. Drill a 1/2-inch hole through the wall covering on the opposite side of the wall at one of the corners of the window opening, then cut around the inside of the opening with a reciprocating saw and remove the wall covering. 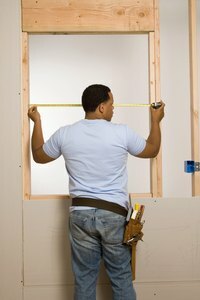 Install the window in the opening, fasten it to the framing, then repair the drywall and trim both sides of the window. It is always safer, though less economical, to use a wider lintel. If you aren't sure what size to use, consult a building specialist. When installing a wide window in a wall supporting a lot of weight, such as one in the ground floor of a multistory house, there is a possibility of the wall shifting when you cut the studs. To prevent this, support the top plate with a temporary structure until the lintel is in place.